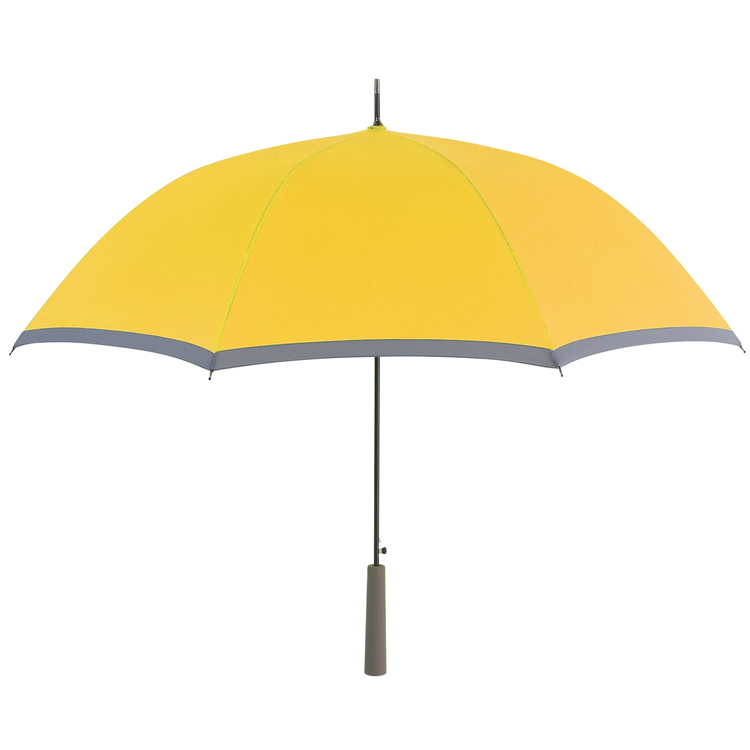 37 Inch Micro Mini Pencil Umbrella SALE NOW ONLY $7.65 Minimum order quantity for sale price 100 pieces. Lower quantity available. Please inquire for free quote. 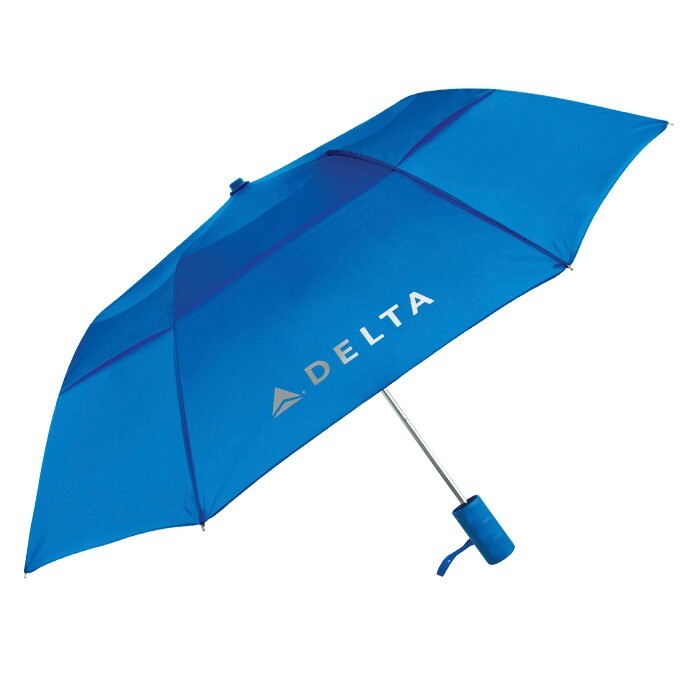 • As slim as a pencil and lightweight at only 5.2 oz • Folds down to only eight (8) inches long • Keep it in your purse or pocket • Convenient carrying strap • Six (6) panel umbrella • Matching Sleeve • Material - 190T polyester Umbrella Colors: Black, Navy Blue, Red, Royal Blue, Kelly Green, Purple, White. 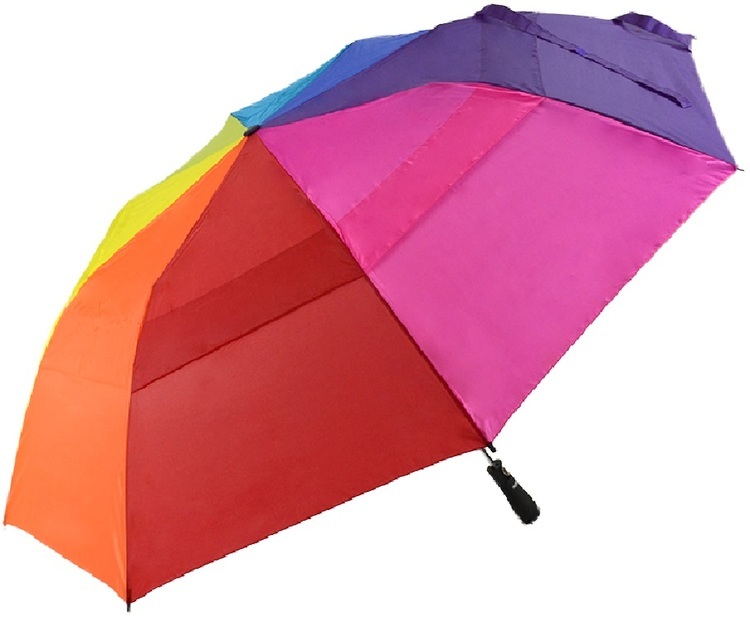 44 Inch Auto Open Compact Folding Umbrella SALE NOW ONLY $6.00 Minimum order quantity for sale price 100 pieces. Lower quantity available. Please inquire for free quote. 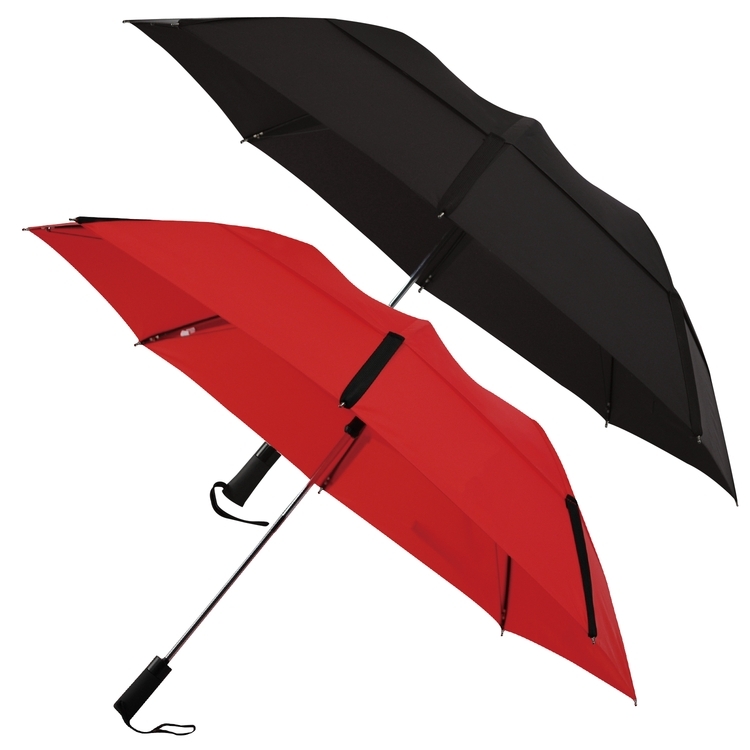 • 44 inch arc umbrella • Folds to twelve and a half (12.5) inches with Velcro closure • Folding auto open heavy metal shaft • Black plastic button for auto open • Features easy one hand operation • Matching sleeve for easy carrying • Wood handle with comfort cord • Eight (8) panel umbrella • Material- 190T nylon Umbrella Colors: Black, Royal Blue, Red, Navy Blue, White, Forest Green. 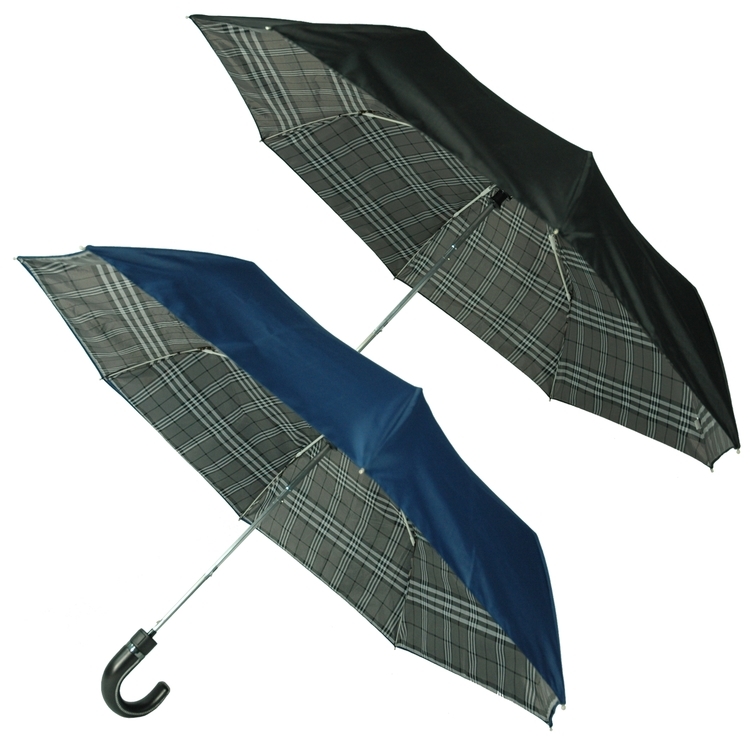 58" Vented Windproof Umbrella CLOSEOUT Now Only $8.85 While Inventory Lasts! 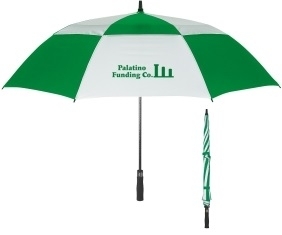 Minimum Order Quantity for Sale Price 24 pieces - Nylon Material - Automatic Open - Vented Windproof Canopy - Fiberglass Shaft And Ribs - EVA Handle Product Color Two-Tone: White/Green Imprint Area: 10" W x 6 ½" H Custom Printing: Price of umbrella includes 1color print on 1 panel. Setup $50.00 per color, per panel. Additional prints .50 per color, per panel, per piece. Multi Color Imprint: Transfer: Add .50 per extra color, per panel, per piece. 4 Color Process: Total Set Up Charge: $200.00. One Color included in price, 3 additional colors at .50 per color, per panel, per piece. Artwork required in vector format (eps, ai or pdf file). Graphic deign services available. Contact us for a free quote on your custom project! 48" Eco Friendly Auto Open Fashion Umbrella CLEARANCE - Now Only $12.00 - While Supplies Last NOW ONLY $12.00 WAS $21.50 Minimum Order Quantity for custom printing 50 pieces How serious are you about the environment? 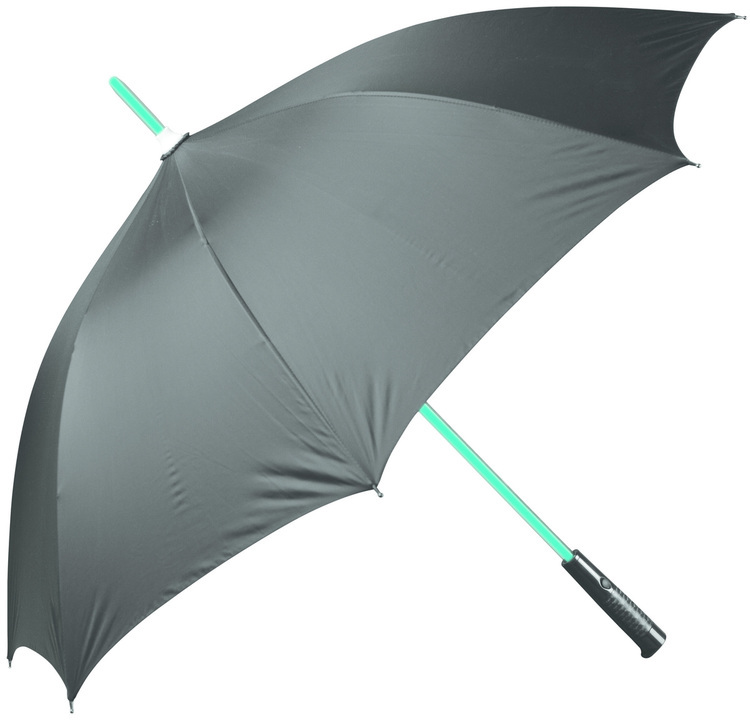 Make more than a statement with Greenbrella - The Eco-Friendly Umbrella. 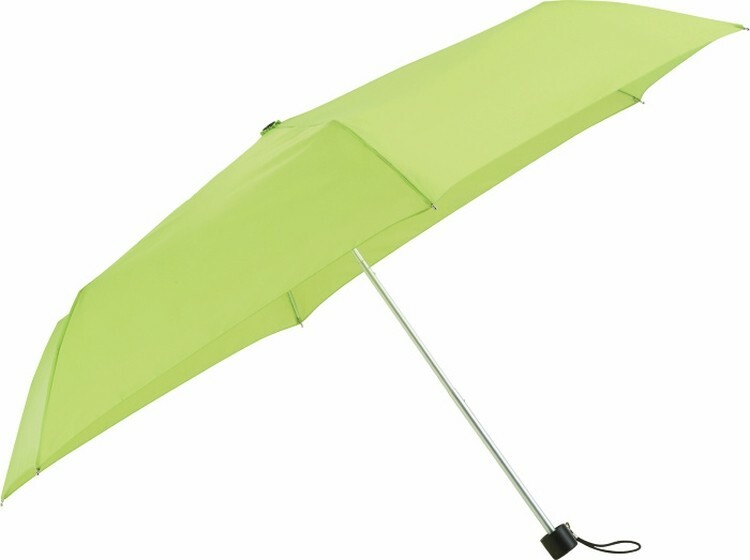 Made From recycled soda bottles (PET), Greenbrella's unique design will help your message stand out in a crowd. 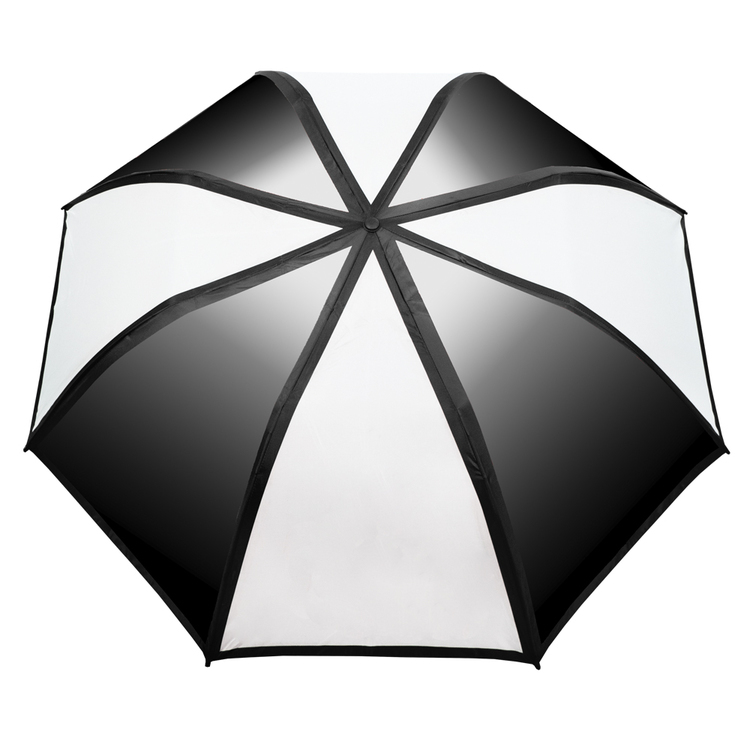 - 48" arc - Auto-open - Wood fashion umbrella European inspired one piece frame and curved wood handle - Black enamel ribs. - Made from 51% recycled PET and 40%polyester. 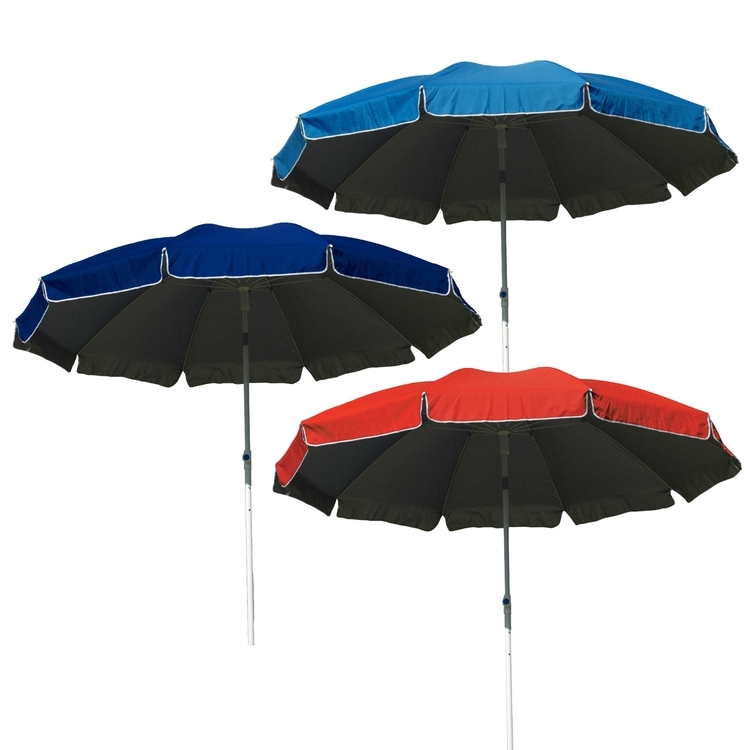 46" Arc Two-Tone Umbrella CLOSEOUT SALE NOW ONLY $8.35 Minimum Order Quantity for sale price 25 pieces. - Automatic Open - Matching Sling Strap Can Be Worn Over Shoulder - Metal Shaft With Rubberized Handle - Polyester Material Product Color; Yellow with Gray trim Custom Printing: Imprint Area 7" W x 4 ½" H Imprint Method: Standard Silk-Screen or Transfer Screen Print Setup Charge; $50.00 per color, per panel. MULTI-COLOR IMPRINT Transfer: Add .50 per extra color, per panel, per piece. *4 Color Process: Total Set Up Charge: $200.00. One Color included in price, 3 additional colors at .50 per color, per panel, per piece. Set Up Charges also apply to re-orders. Production Time: 10 days after proof approval. MULTI-PANEL IMPRINT Add .50 per color, per panel, per piece. Artwork required in vector format (eps, ai or pdf file). Graphic design service available. Contact us for a free quote on your custom umbrellas. 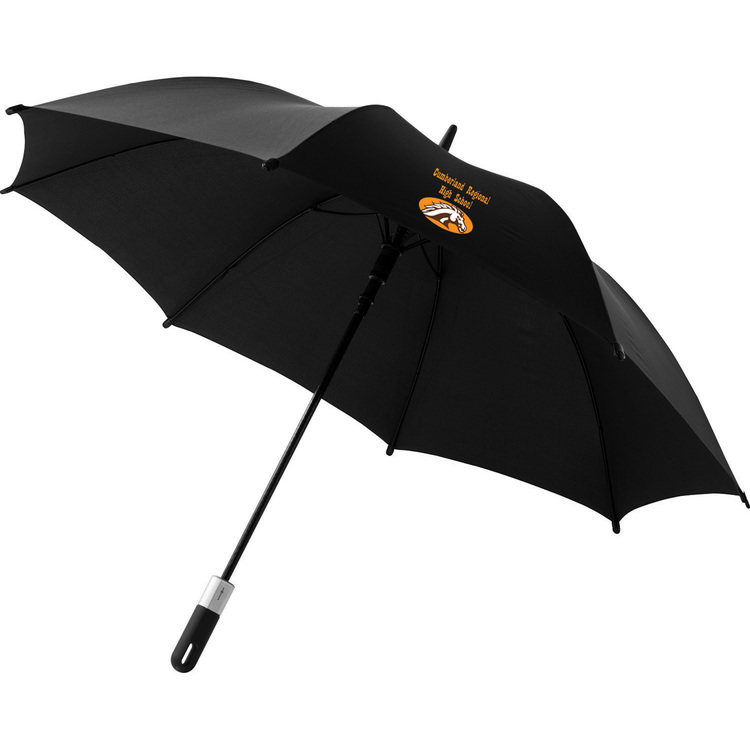 46" Eco Friendly Auto Open Folding Umbrella CLEARANCE - Now Only $10.00 - While Supplies Last NOW ONLY $10.00 WAS $19.00 Minimum Order Quantity for custom printing 50 pieces How serious are you about the environment? 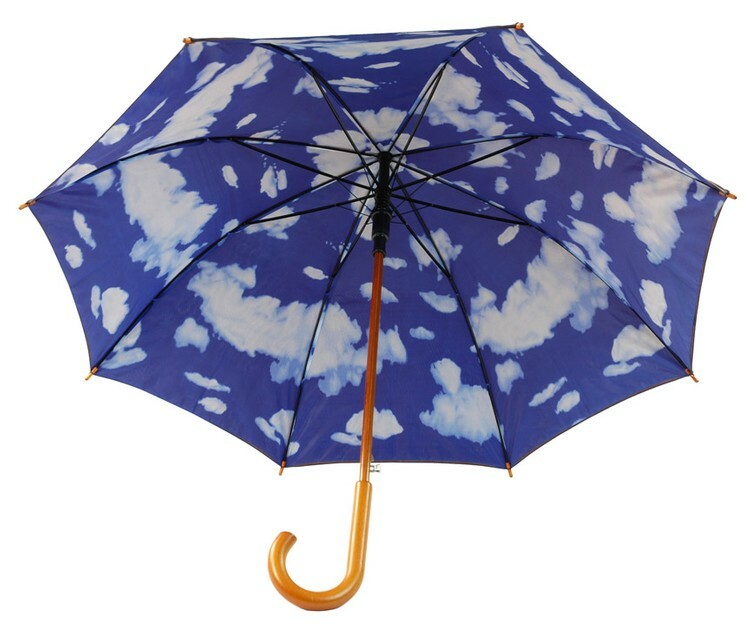 Make more than a statement with Greenbrella - The Eco-Friendly Umbrella. Made From recycled soda bottles (PET), Greenbrella's unique design to place your logo on both panels, will help your message stand out in a crowd. 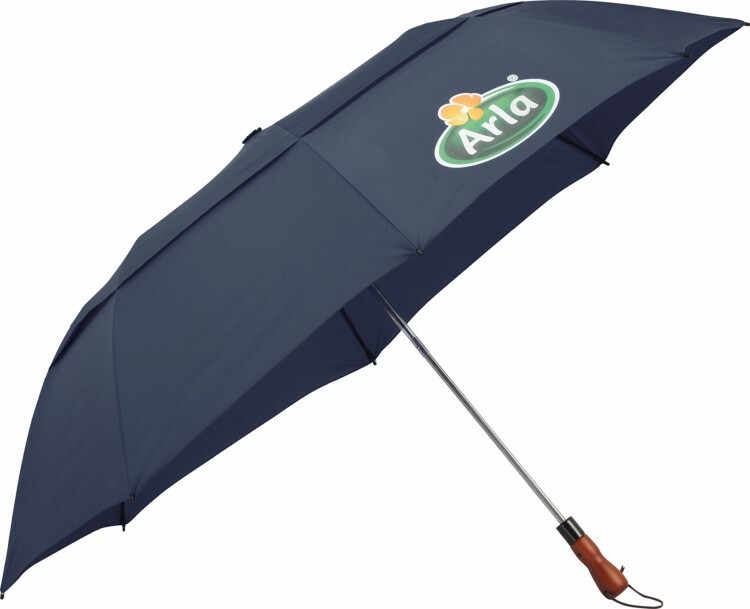 Its auto to open mechanism and 46" arc allows for protection against the always unpredictable weather. - 46" arc. - Auto open folding umbrella. - Black enamel frame and ribs. - Natural wood handle and cotton strap. - Made from 51% recycled PET and 40%polyester. 60 Inch Auto-Open Clear Panel Umbrella SALE NOW ONLY $12.92 Minimum Order Quantity for sale price 72 pieces • 60 Inch canopy with Clear Panel • Auto Open • Steel shaft • Nylon fabric • Matching Acrylic handle • Matching sleeve with shoulder strap • Folded Length: 37.5" • Arc: 60" Product Colors Available: Black, Navy, Burgundy, Red, Royal Blue, Hunter Green, Orange, Purple Custom Printing: Price of umbrella includes 1color imprint on 1 panel. Setup $62.50 per color. Additional imprints; $1.66 each Panel imprint area: 10" W X 8" H Max 3 color imprint on clear panel. 4Color Process Setup (not available on clear panel); Less than 125 pieces - $175.00 More than 125 pieces - $62.50 Setup charges apply for original & repeat orders 36 - 125 prints; $5.00 each 126 - 600 prints; $3.75 each 601 - 1500 prints; $3.33 each Artwork required in vector format (eps, ai or pdf file). Graphic design services available if needed. Contact us for a free quote on your custom order! 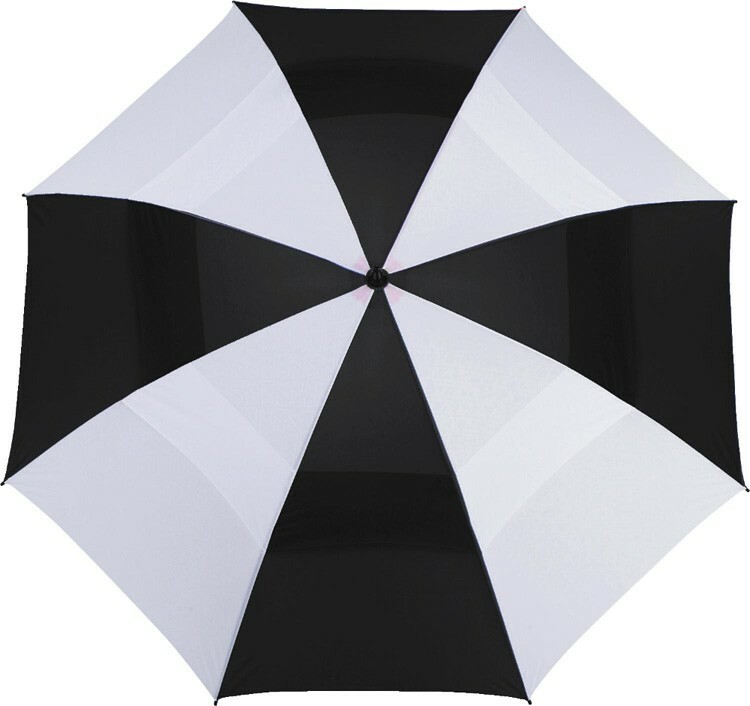 58 Inch Auto-Open Vented Folding Colossal Crown Umbrella SALE Until June 30, 2019 NOW ONLY $11.89 WAS $16.79 Minimum Order Quantity for sale 24 pieces Lower quantity available at regular price. - Automatic opening - Large colorful upper vent with contrasting black lower panels - Extra strong black six-sided metal shaft - Fiberglass ribs for added strength - Comfortable matching foam handle with braided wrist strap - Matching fabric case with shoulder strap - Each panel of the umbrella’s canopy contains a wind venting passage that allows strong winds to pass through and minimizes potential wind breakage to the umbrella’s frame. Available colors: royal blue/black, lime green/black, teal/black, red/black, orange/black, rainbow/black and white/black. 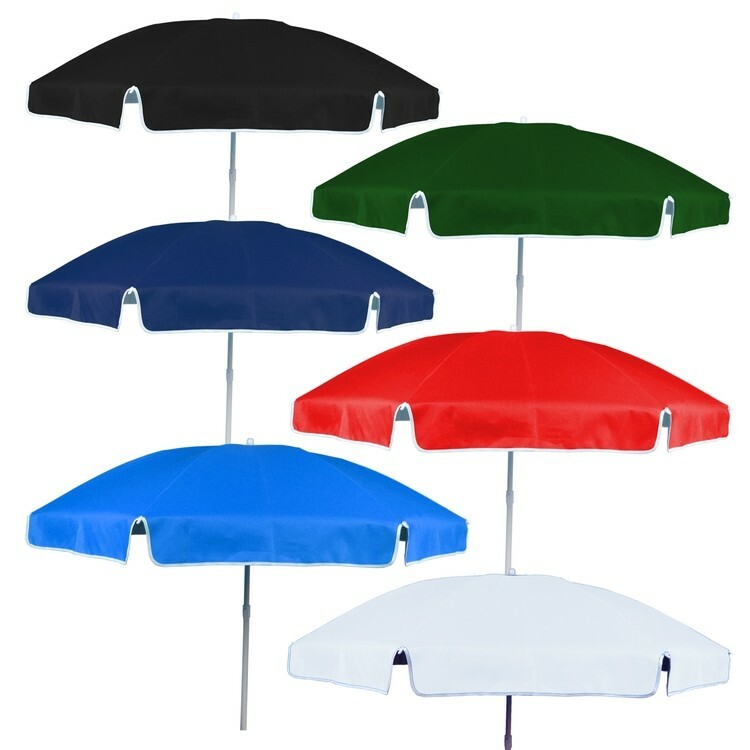 58 Inch Folding Auto Open Vented Fiberglass Umbrella SALE - 32 Colors! 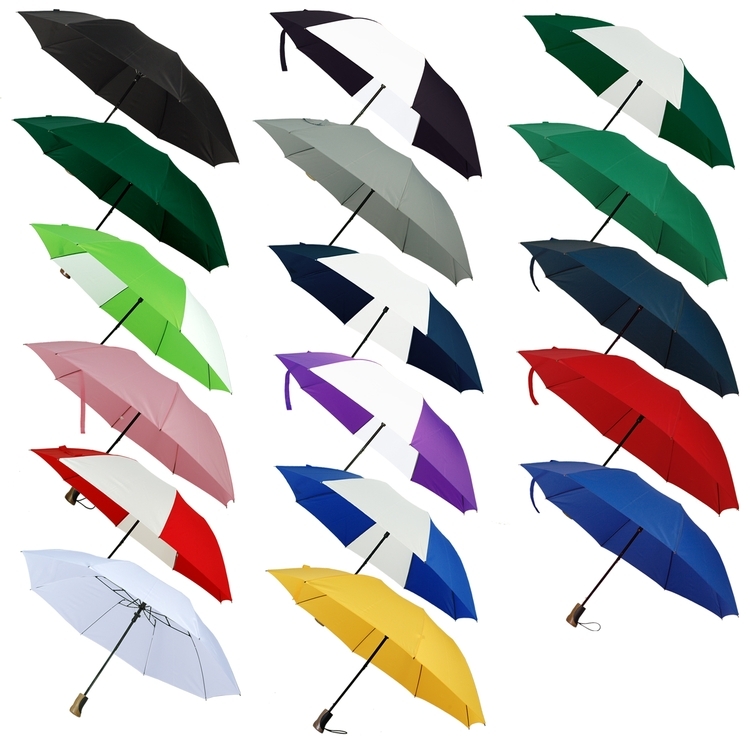 58 Inch Folding Auto Open Vented Fiberglass Umbrella SALE - 32 Colors! NOW ONLY $12.25 each! Minimum Order Quantity for sale price 72 pieces Lower quantity available at regular price. • Auto open • Steel wind resistant frame with Fiberglass Ribs • Nylon fabric • Black rubberized handle • Vented Canopy • Pinch proof runner to protect fingers • Matching sleeve with shoulder strap • 32 Colors Available Dimensions: Folded Length: 22" • Arc: 58" Product Colors Available: SOLIDS: Black, Red, Burgundy, Royal, Navy, Hunter Green, Sky Blue, White, Khaki, Orange, Yellow, Teal, Grey. COLOR COMBINATIONS: TWO TONE: Black/White, Navy/White, Red/White, Burgundy/White, Royal/White, Purple/White, Orange/White, Hunter/White, Burgundy/Gold, Black/Gold, Navy/Gold, Hunter/Khaki, Black/Khaki, Navy/Khaki, Black/Red, Black/Grey, Burgundy/Gold, Purple/White, Navy/Gold, Royal Blue/Sky Blue. OTHER; Red/White/Navy RAINBOW color available $13.32, comes with clear vinyl sleeve with snap closure. 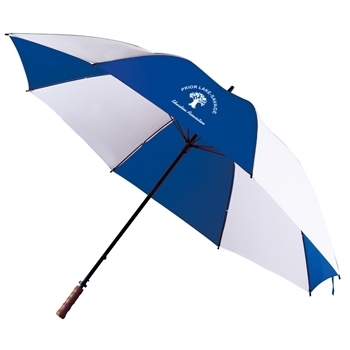 Custom Printing: Screen Print Price of umbrella includes 1 color imprint on 1 panel. Setup $62.50 per color. Each additional imprint $1.66 (up to 5 spot colors) Imprint area: 10" x 6.5" centered bottom canopy Additional Options: Sleeve imprint: $1.66 plus setup. PMS ink match, if required : $25.00 per color. No charge to match color of umbrella. Optional 4Color Process printing: 36 - 125 prints; $5.00 each 126 - 600 prints; $3.75 each 601 - 1500 prints; $3.33 each 4Color Process Setup; Less than 125 pieces - $175.00 More than 125 pieces - $62.50 Setup charges apply for original & repeat orders Artwork required in vector format (eps, ai or pdf file). Graphic design services available. Contact us for a FREE quote on your custom umbrellas! 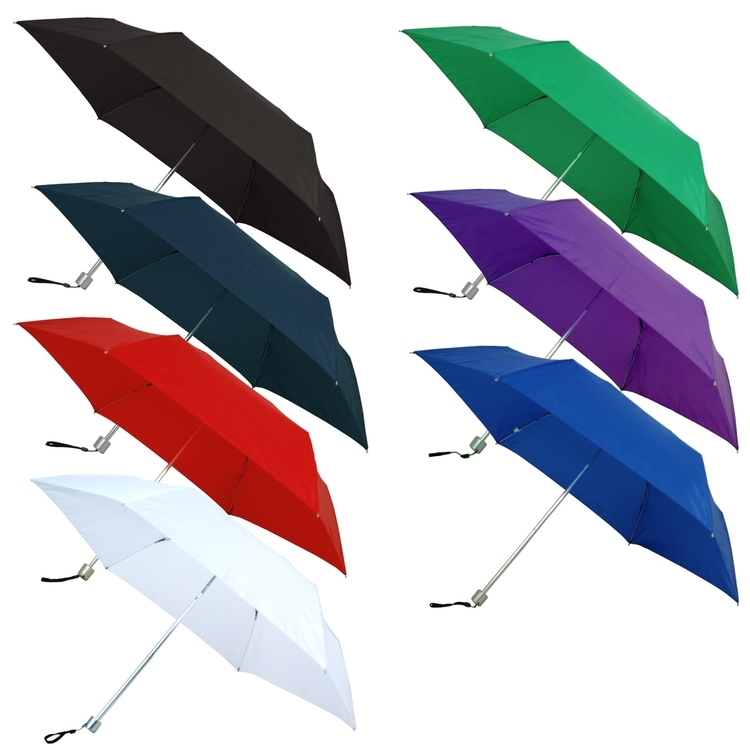 58 Inch Folding Auto Open Gradient Color Umbrella CLOSEOUT DEAL NOW AS LOW AS $8.99 WAS $20.99 - Alternating gradient color panels with black border - Extra large 58" canopy arc (Diameter: 51), 8 panels - Automatic opening - Fiberglass ribs - Extra strong six-sided chrome shaft - Folds to 22" long - Matching gradient case with shoulder strap - Black rubber ribbed handle with wrist strap Available colors: Black gradient/White. Imprint area: 8"H x 8"W (on White panels only) Custom Printing: Spot Color Screen Print: Setup: $80.00 per color Price of umbrella includes 1 color imprint on 1 location. Additional imprints; $1.60 each. PMS Matching, if required: $42.00 per color. 4Color Process/Full Color printing: Setup; $120.00 Number of prints 24 48 96 240 480 1008 Cost per print $6.75 4.00 3.75 3.50 3.00 2.50 4color process production time; 10-12 days. Optional imprint on case: $2.00 each, plus setup $80.00 ( 1color print max on case ) Artwork required in vector eps, pdf or ai format. Graphic design services available. Contact us for a free quote on your custom umbrella. 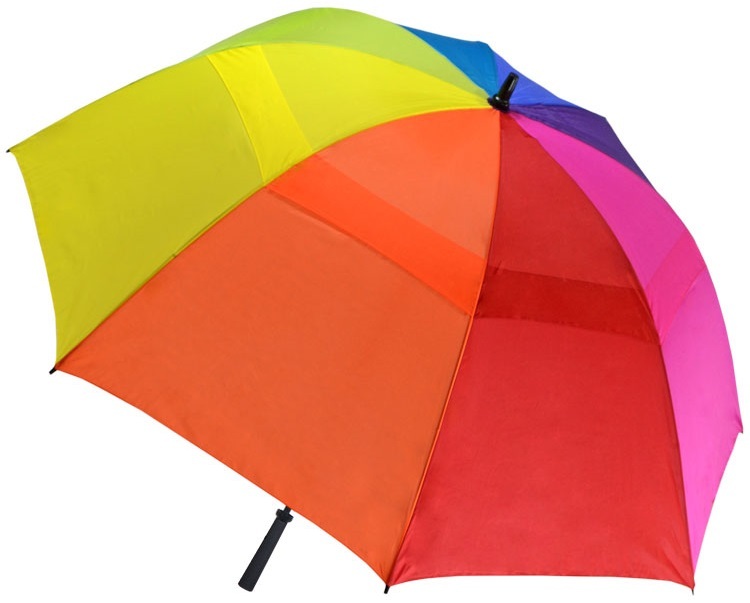 43 Inch Auto Open Folding Umbrella SALE - 51 Colors! NOW ONLY $7.50 each Minimum Order Quantity for sale price 72 pieces Lower quantity available. 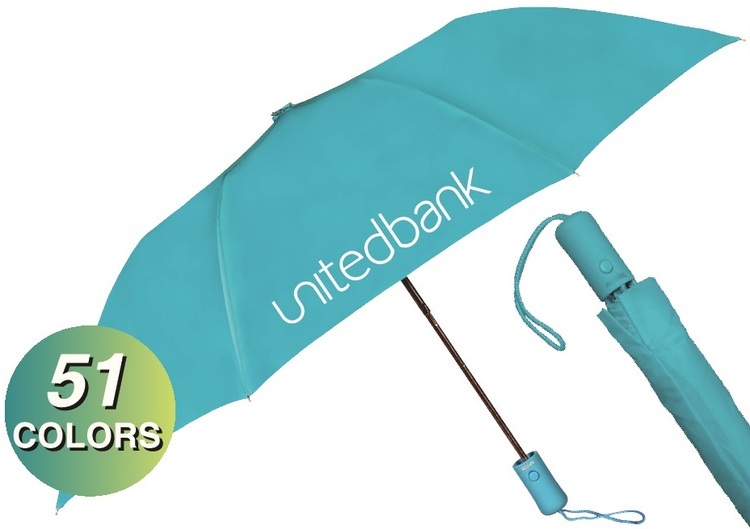 A strong construction, rubberized handle and auto open design make this umbrella a great value! • 43" Arc, Folds to 15.5" • Automatic open • Steel wind resistant frame • Nylon fabric • Color matching rubberized handle • Pinch Proof Runner to Protect Fingers • Matching Sleeve 51 colors! SOLID COLORS; Black, Navy Blue, Royal Blue, Sky Blue, Burgundy, Red, Khaki, Hunter Green, Lime Green, Brown, Orange, Yellow, Teal, Grey, Purple, Pink, Fuchsia, White, Old Gold, Rust, Cardinal Red. COLOR COMBINATIONS: Black/White, Navy/White, Royal/White, Red/White, Burgundy/White, Evergreen/White, Purple/White, Hunter/White, Teal/White, Orange/White, Carolina Blue/White, Grey/White, Burgundy/Gold, Black/Gold, Navy/Gold, Purple/Gold, Royal/Gold, Hunter/Gold, Red/Black, Navy/Orange, Royal/Orange, Black/Orange, Grey/Red, Navy/Khaki, Navy/Hunter, Royal Blue/Sky Blue, Black/Khaki, Hunter Green/Lime Green, Red/White/Blue. Rainbow color available; $7.99 each Custom Printing: Screen Print Max imprint area: 7"W x 6.5"H Price of umbrella includes 1 color imprint on 1 panel. Setup $62.50 per color. Each additional imprint $1.66 (up to 6 spot colors) Additional Options: Sleeve imprint: $1.66 plus $62.50 Screen setup. PMS ink match, if required : $25.00 per color. 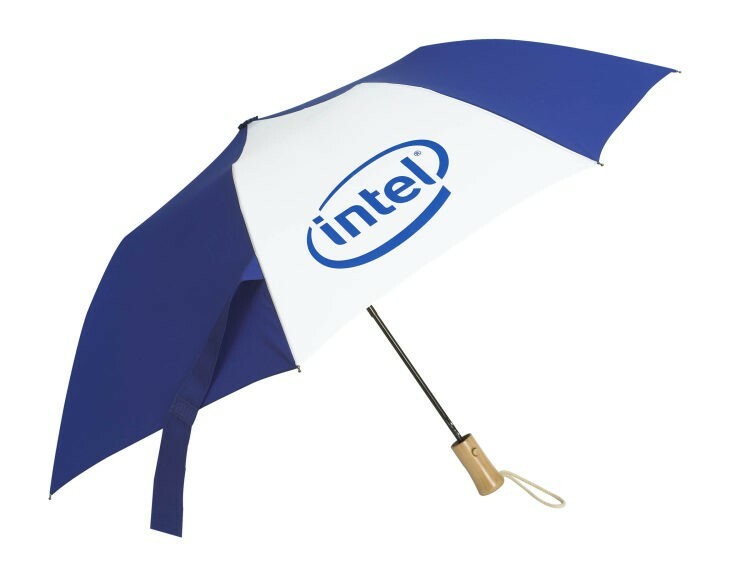 No charge to match color of umbrella. 4Color Process printing: Setup; Less than 125 pieces - $175.00 More than 125 pieces - $62.50 4Color Process prints: 36 - 125 prints; $5.00 each 126 - 600 prints; $3.75 each 601 - 1500 prints; $3.33 each Artwork required in vector format eps, ai or pdf file. Graphic design services available. 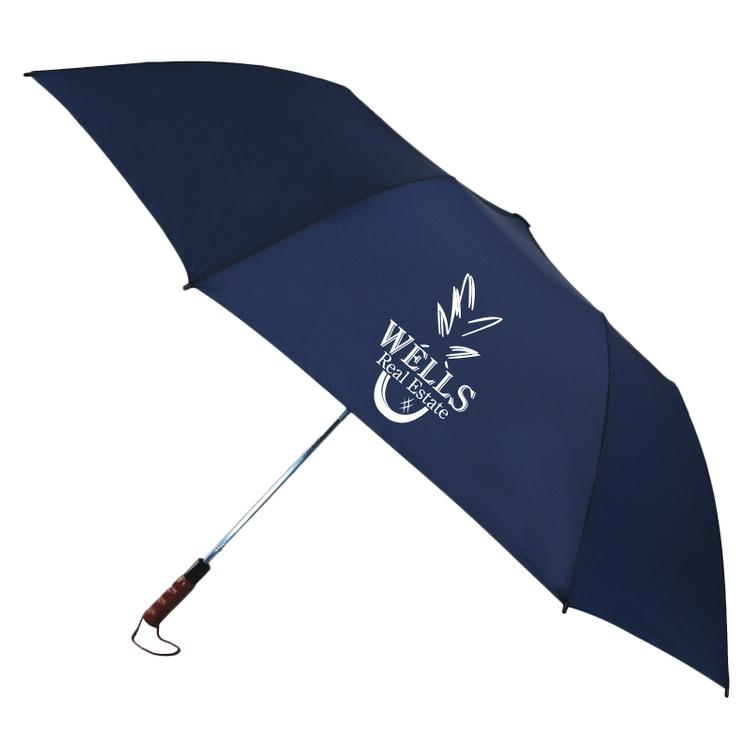 Contact us for a FREE quote on your custom umbrella! The 47" Clear Transparent See Through Umbrella SALE NOW ONLY $3.34 Minimum Order Quantity for sale price 100 pieces. Lower quantity available at regular price. 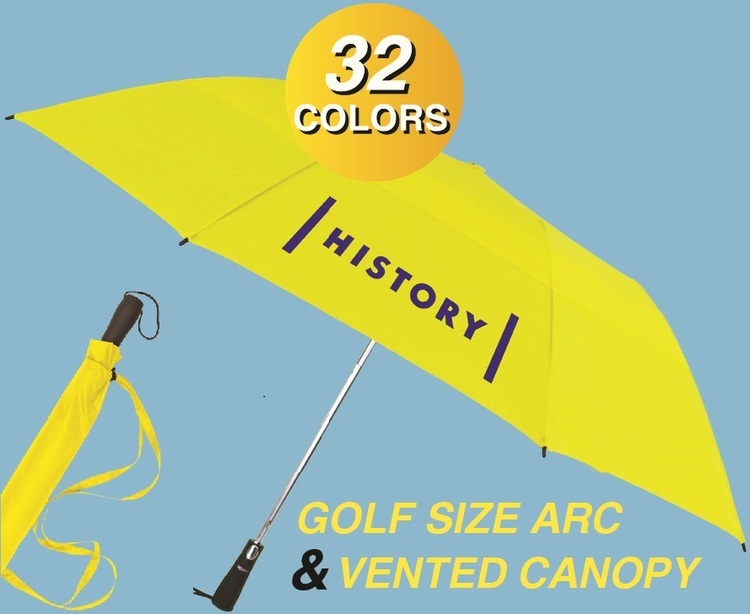 • Forty-seven (47) inch arc • Unique choice for an alternative promotional product • Sleek clear design OFFERED BLANK ONLY - NO IMPRINT ON THIS UMBRELLA Product Colors: Pink, Yellow, Red, (trim). 48 Inch LED Lighted Umbrella SALE NOW ONLY $18.99 WAS $39.00 Minimum Order Quantity 25 pieces Make your rainy days more colorful with this umbrella. The LED lighted shaft and tip change between seven different color options and comes with an LED lighted flashlight handle. 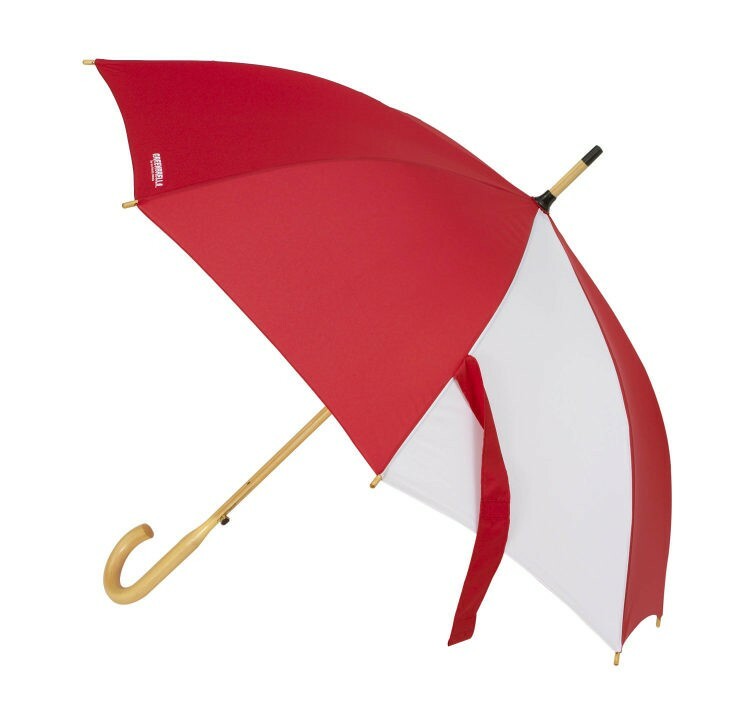 - Available in 48” size - Lighted shaft, handle and umbrella tip - Shaft and tip change between Seven different lighted colors - Push button lighted handle - Batteries included Custom Printing Price of umbrella includes 1 spot color imprint on 1 panel run, standard ink color. Screen; $100.00 per color, per logo. Additional prints; $2.50 each. Optional PMS ink match; $25.00 each. Artwork required in vector format (eps, ai or pdf file). Graphic design services available if needed. Contact us for a free quote! 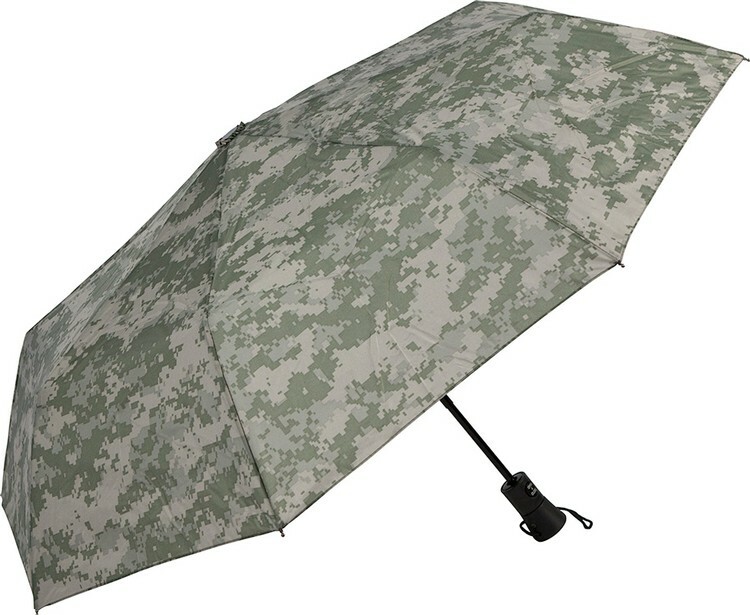 42 Inch ACU Digital Camouflage Auto Open & Close Folding Umbrella SALE NOW ONLY $11.99 WAS $25.00 Minimum Order Quantity 25 pieces Patriotic, sleek, subtle, digital camouflage umbrellas. Perfect for military organizations, schools and outdoor enthusiasts. 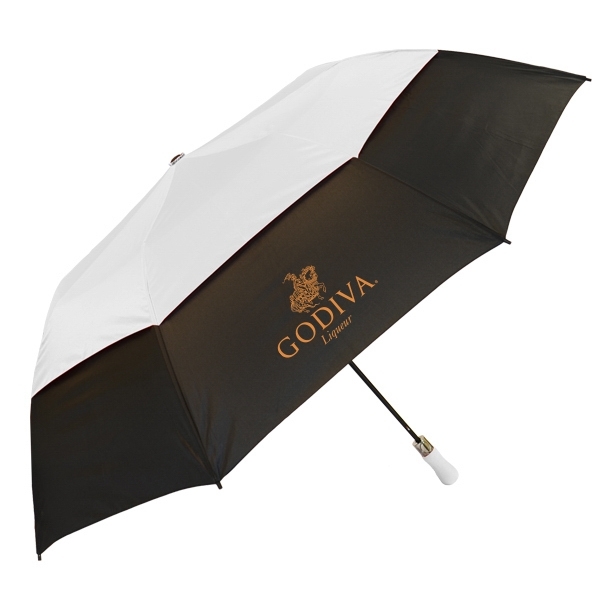 Custom Printing Price of umbrella includes 1 spot color imprint on 1 panel run, standard ink color. Screen; $100.00 per color, per logo. Additional prints; $2.50 each. Optional PMS ink match; $25.00 each. Artwork required in vector format (eps, ai or pdf file). Graphic design services available if needed. Contact us for a free quote! 43 Inch Folding Wind Proof Auto Open Umbrella SALE NOW ONLY $9.17 Save $3.60! Minimum Order Quantity for sale price 100 pieces Lower quantity available. Please inquire for free quote. 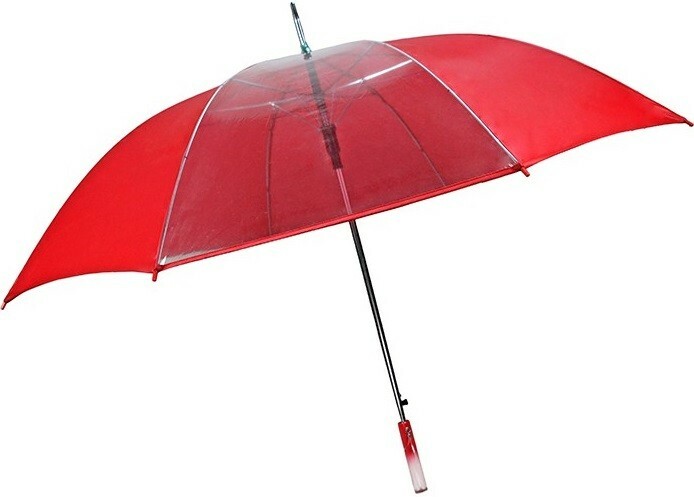 • Patented windproof design in a super compact package • Premium steel armature and shaft for extra strength • Comes packaged in a drawstring carrying case • Forty-three (43) inch arc • Automatic open action • Handy carrying strap • Rubber comfort grip • Material: 190T Nylon Umbrella Colors: Black, Red. 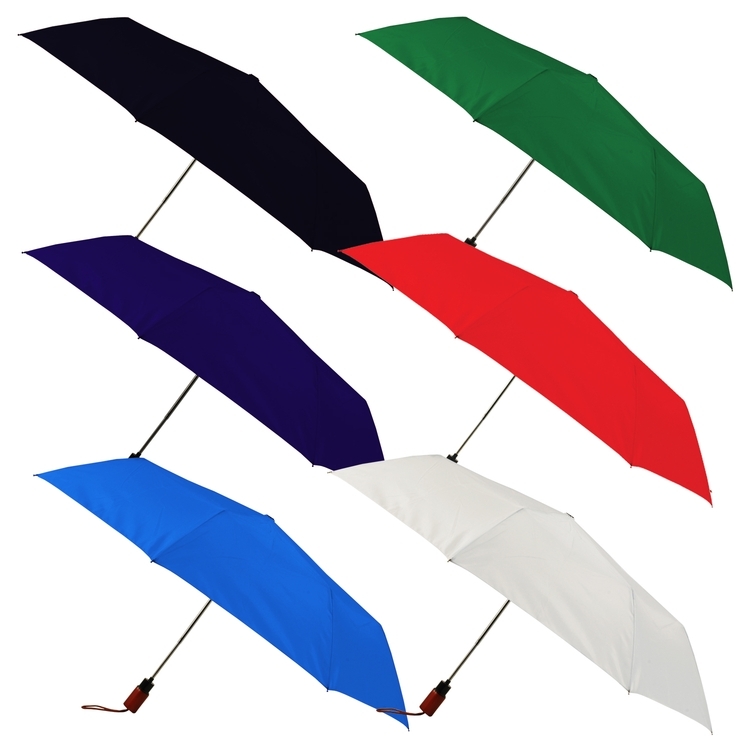 42 Inch, Auto Open, Windproof, Vented Umbrella SALE - ONLY $7.99! 42 Inch Auto-Open Windproof Vented Umbrella SALE Until June 30, 2019 NOW ONLY $7.99 WAS $11.79 Minimum Order Quantity for sale 48 pieces Lower quantity available at regular price. 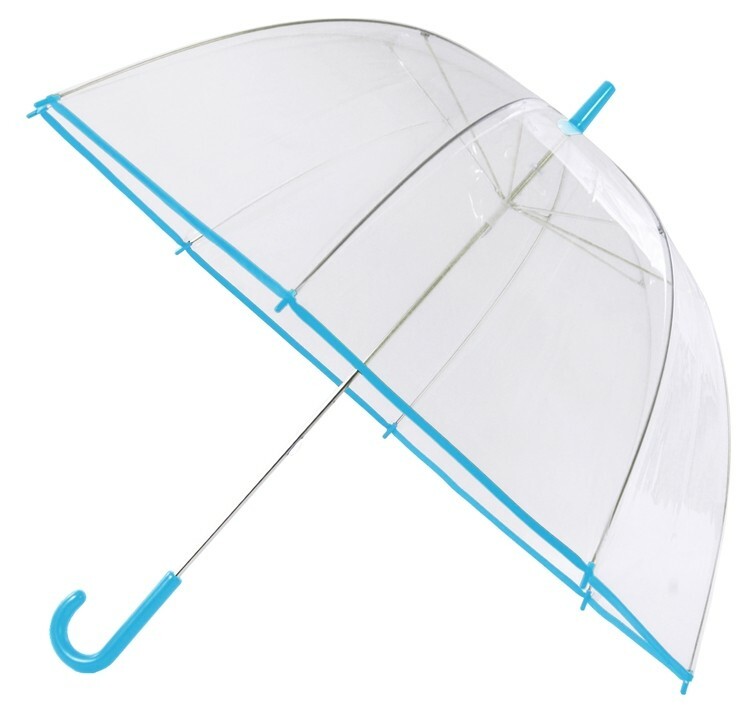 - Automatic opening - Windproof frame construction - Sturdy metal shaft - Rubberized matching sure grip handle with wrist strap - Matching fabric case - Each panel of the umbrella’s canopy contains a wind venting passage that allows strong winds to pass through and minimizes potential wind breakage to the umbrella’s frame. Available colors: Solids: Black, Royal Blue, Hunter Green, Navy Blue, White, Lime Green, Rust, Pink, Carolina Blue. Two Tone: Royal Blue/White, Red/White, Navy Blue/White, Hunter Green/White, Black/White.